What is with my fascination with neapolitan? Three delicious flavors that go together perfectly! I've seen several combination of Neapolitan cupcakes, but I think this is my favorite (probably because it's the easiest). 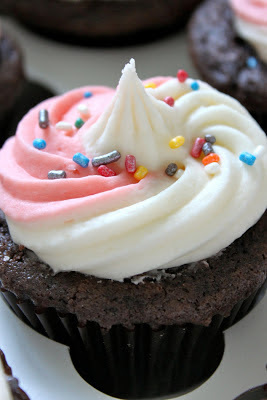 Baked Perfection posted a recipe for Neapolitan Cupcakes, which uses a chocolate cake mix as the base for the cupcakes. Some recipes use several flavors of cake layered or swirled together. Baked Perfection adds the strawberry and vanilla flavors in the frosting by swirling them together. Easy is always my game. You can find the full recipe here.